Most weight-loss plans advocate you consume generous amounts of fruits and vegetables. A study published in a 2015 issue of the journal PloS Medicine showed that people who ate increased portions of high-fiber, non-starchy vegetables and fruits over four years lost weight. No fruit or vegetable, or any other food, for that matter, can actually burn fat from your body, though; that's not how fat loss works. But, the fiber and nutrients in vegetables and fruits make them valuable to your diet when you're trying to lose weight. Fat loss happens when your body senses an energy shortage between calories consumed and burned. Fat cells store energy in the form of triglycerides. Before that fat can be used for energy, it must be broken down into its parts: glycerol and fatty acids. This is a complex biochemical process that no one food can make happen. Eating less and moving more create the calorie deficit required for your body to burn fat. A pound of fat equals 3,500 calories, so a deficit of 500 to 1,000 calories per day results in 1 to 2 pounds lost per week. Fruits and vegetables help you create this deficit when you use them to replace higher calorie, processed fare such as sweets and snack foods. For example, dip carrot sticks and red bell pepper into salsa instead of tortilla chips. The carrots have just 50 calories per cup and the pepper 29 calories, while the tortilla chips boast 132 calories per ounce -- or about 13 chips. If you successfully save just 100 calories daily with this kind of strategy, you can lose more than 10 pounds in one year. The fiber in produce digests slowly and helps you feel full so it's easier to reduce calories without feeling extremely deprived. A 2008 study published in Nutrition Research showed that a higher fiber intake from fruits and vegetables correlates with greater weight loss. A 2014 issue of the European Journal of Clinical Nutrition showed that people who ate increased portions of vegetables as part of a low-calorie diet lost more weight and reported greater satisfaction after three months compared to people who limited their produce intake. Listing just five vegetables that benefit fat loss is almost impossible as most are valuable to your diet. Some fresh vegetables offer more nutrients than others and are more beneficial on a weight-loss plan, though. When offered a choice, skip the iceberg lettuce and cucumbers, and go for darker green options instead. Richly colored varieties such as kale, baby spinach and broccoli usually have more fiber and phytonutrients. Green isn't the only color that you should go for when choosing vegetables. Purple eggplant, white cauliflower and red peppers provide essential antioxidants and filling fiber. Have yellow winter squash or sweet potatoes at several meals each week too. Fruit makes a superior snack when compared to junky options such as pastries, cereal bars, snack mixes and juice. Whole, fresh fruit makes you chew, so you feel as if you've consumed something substantial. As with vegetables, go for a variety of colors. Purple and red berries, green apples, yellow pears, citrus and stone fruits -- such as plums and peaches -- offer plenty of nutrients. A study published in a 2008 issue of Appetite showed that eating 200 calories of fruit per day as part of an energy-restricted diet helped women lose weight compared to women who ate the same energy-restricted diet but added the 200 calories from cookies. Higher-calorie fruits, such as bananas and papayas, are more calorie-dense so make sure you account for them in your total intake. Avoid dried and canned fruit when trying to lose weight, however. Dried versions have their calories concentrated into small servings, and canned versions often contain sugar syrup. 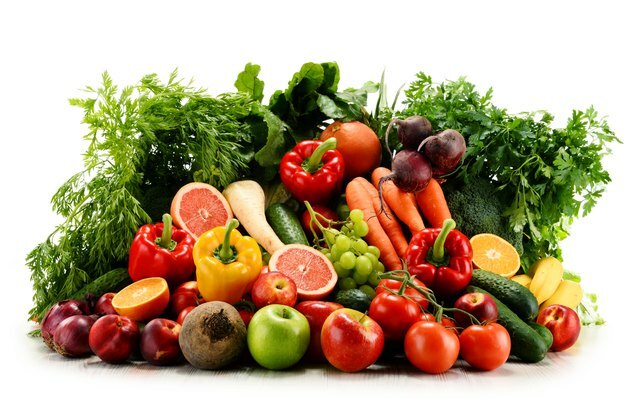 In general, fruit has about three times the calories as non-starchy, watery vegetables though. So too many servings per day can add up and cause you to overshoot your calorie goal -- and decrease your fat loss -- if you aren't careful. A few fruits and vegetables do have qualities that incrementally increase your metabolism so you burn more calories, upping your calorie deficit. Hot chili peppers contain a compound known as capsaicin, which revs the rate at which your body undergoes the processes required to oxidize, or burn, fat. Often when you decrease calorie intake, your body naturally reduces your resting metabolism -- or the amount of calories and fat you burn to survive -- to conserve energy. In a 2013 study in PLoS One, researchers found that when participants reduced their calorie intake by 25 percent, they really only experienced a 20.5-percent deficit because of these compensatory metabolic processes. Dieters who were given a dose of capsaicin at every meal had metabolisms that continued to burn at a normal rate, despite the 25-percent calorie restriction. In this 24-hour study, participants didn't experience greater fat burning, but the drop in fat burning that inevitably happens when you reduce calories seemed to be lessened in those who consumed capsaicin. Monounsaturated fat, when eaten in place of saturated fat, also has the potential to slightly increase your metabolism, reported a 2013 study in the American Journal of Clinical Nutrition. Not a lot of fruits and vegetables contain notable amounts of this, or any, fat, except for olives and avocados. Avocados support weight management just as effectively as other fruits and vegetables, reported a review published in Critical Reviews in Food Science and Nutrition in 2013. Of course, because of the higher calorie load in olives and avocados, be sure to keep your servings to a minimum and account for the calories in your daily total intake. Too much of any food can cause you to eat too many calories and prevent fat loss. Fruits and Veggies More Matters: About the Buzz: Cruciferous Vegetables Can Burn Abdominal Fat? CNN: Can Eating Too Much Fruit Keep Me From Losing Weight?